What are the standard bathtub sizes? Dimensions of bathtubs cannot be generalized, and every manufacturer will have its own tub specifications for specific product, but when it comes to the basics there are standard bathtub sizes by the types of tubs which allow customers and installers make prediction with a house design and installation process. 60" x 30"(32") x 14"-30"
60" x 32"(30") x 30"
Dimensions in the chart are external measurements of standard bathtub not actual in tub sizes. Capacity is a factor which defines the interior tub space in gallons. In-side dimensions will vary even comparing the same external tub sizes and will be identified by bathtub shape and style. 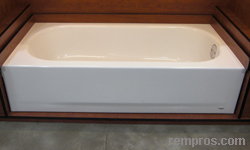 Some of the free standing bathtubs might have legs which will add another 4” – 5” to the total bathtub height. All sizes in the chart are imperial characteristics of a bathtub length width, and height in inches. The least important number is a bathtub height which does not affect installation much and even for a standard 60”x30” bathtub might vary a couple inches both ways. How to measure rough framing for standard wall to wall bathtub? The most important number is a length of a wall to wall bathtub. While framing a bathroom the opening for a standard 5’ long tub has to be specified as exact measurements of distance in between wall studs not including or adding the thickness of a tile, backer boards or water resistant drywall. Corner bathtub typically has a triangle rounded shape with a length and width usually equal referring to dimensions of the sides leaning to the corner walls. Technically most of the bathtubs can be installed in the corner of a bathroom regardless it’s shape. Knowing the exact measurements of a corner bathtub is not a crucial factor because it can fit in any square corner if the bathroom size will allow. What is a drain placement in the standard bathtub? There is no such standard in the term of exact drain position. Some wall to wall bathtubs have a drain within a few inches from the longer side centered by width, some whirlpools or corner tubs have drain placed in the center. Plumber has to pipe drains according to bathtub construction. What are standard dimensions of a whirlpool bathtub? 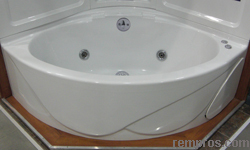 Jacuzzi tubs are not separated into specific group by its sizes. Whirlpools will have the same dimensions as a regular bathtub, except they might be not available in every standard sizes and usually refer as a bigger capacity and specifications products. Standard bathtub dimensions in metric system. Converting 60”L x 30”W x 20”H equal 1524mm x 762mm x 508mm. But the factor of standards has to be taken into consideration. For many countries 5” wall to wall size is not a size of any construction standards and 180cm x 70cm x 45cm with a 140 liters capacity will not be considering as a custom dimensions.